Flashback Friday with Octopus Party! Happy Friday! Right about now, I should be relaxing in VA after a long drive. Pain meds and heating pad will be in order! I decided to get this post going for you guys while I’m away. 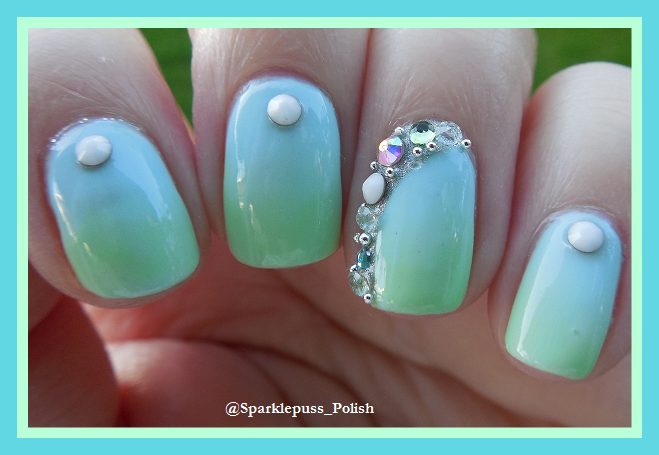 This mani is a pretty nice one, if I say so myself! I should have just called this past week OPNL week! Here I am again with another Octopus Party Nail Lacquer post- this time using Crown of Queen Elizabeth, which is a sheer, crazy holo. Upon build up, the holo is awesome! Crown of Queen Elizabeth by Octopus Party Nail Lacquer in Flash lighting. For this mani, I did 3 coats of CoQE. Formula was superb as always! I then used Gothic Gala Lacquers Basic Black to stamp on my ring and index fingers using plate BPL-027 from Born Pretty. The black rhinestones are also from Born Pretty. There are a lot of cool black shapes in that wheel. If you’re interested in getting anything from Born Pretty, you can use my code- LESLIEW10 for 10% off of your order. Hope you all liked this flashback! I LOVE this combo! The stamp is so crisp! Definitely one of my favorite OPNLs to date!